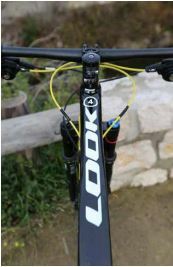 Even if the hours of glory of Look are more remarkable on the road than on trails, the Nivernais brand offers an interesting mountain bike range articulated around 3 frames, the 927, 977/979 and 987/989. Behind those names, at first not very suggestive, we can already understand that the last number indicates the wheels diameter of the frame. Then, the frames 927, 977 and 987 are intended for 27,5- inch wheels whereas the 979 and 989 are intended for 29 inches. Let’s put aside the model 927, the full suspension bike of the range and let’s see the two rigid frames, the 97x and 98x. 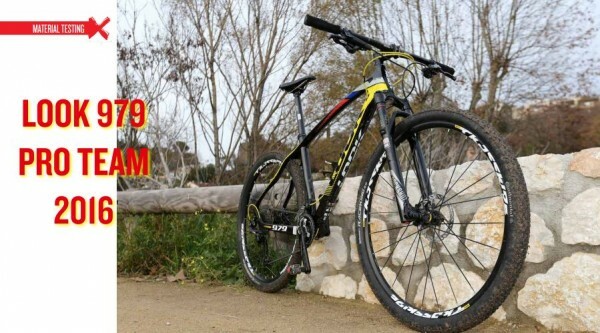 The 27,5-inch models are only available for sizes S and M whereas the 29-inch models are reserved to sizes M and L. This choice is intelligent, because it allows to avoid to have a disproportioned bike. 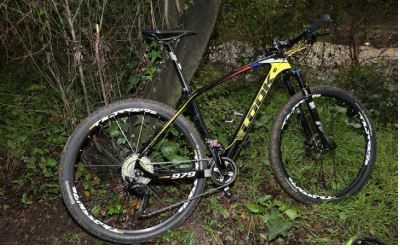 The 27,5-inch frame is more lively in restarts, lighter and handier whereas the 29 inches offers a better stability, more adherence, easier to overcome obstacles and a better top speed. 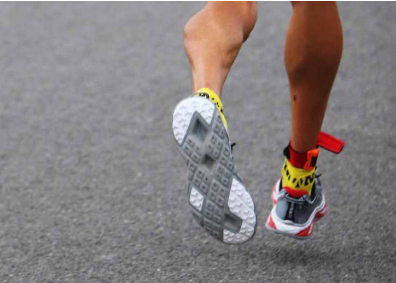 The frames 977 and 979 have exactly the same technical characteristics and use the same technologies. 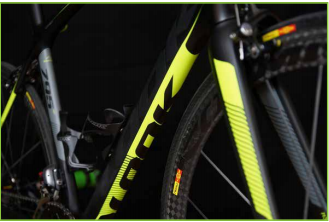 We are now familiar with the different appellations of the carbon frames. Here, the frame uses High Module fibers which will allow to obtain a light frame while keeping a rigidity guaranteeing a good yield without affecting comfort. The weight gain compared to an aluminum frame is important and it is the interest of this kind of frame. The manufacturer weight is 130gr in size M for the 979. 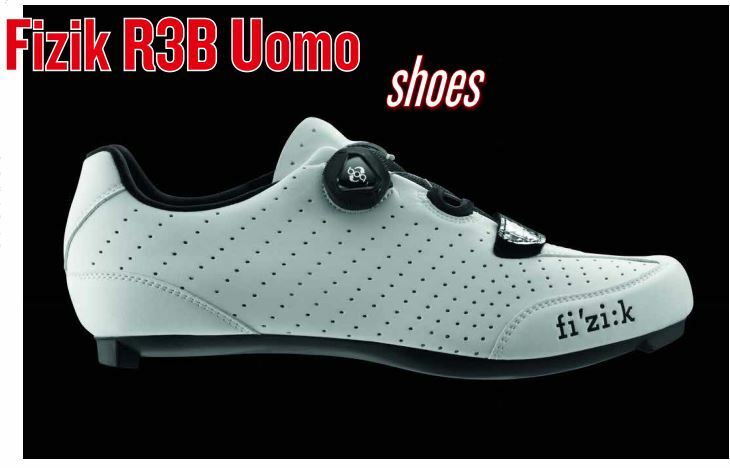 The mono-bloc manufacturing will also contribute to the lightness and resistance of the frame. La construction monobloc va elle aussi contribuer à apporter légèreté et résistance au cadre. Ah the bottom bracket formats and their weird names, it’s quite a story! Here, we have a Press Fit format: understand that the cups sink into the frame, without having to be threaded. This format allows to mount a Shimano Press Fit crank and thus to receive a bottom bracket with a 24mm axis. The interest of the Press Fit system is to offer a better facility of mounting but also to allow bearings to be more separated the one from the other to offer more rigidity. With the arrival of the Di2 on road frames, we saw at first the arrival of Di2 versions of existing frames. Thus, you had to choose when you were buying the bike between a standard version or a version accepting electronic mountings, forbidding then any evolution. 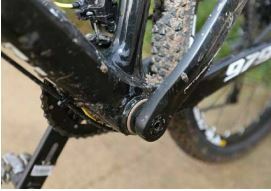 To avoid problems, with the arrival of Di2 on mountain bikes, it is pleasant to see that the sheath abutments are removable to replace them by versions dedicated to the electronic system when we want to have a more evolved group. 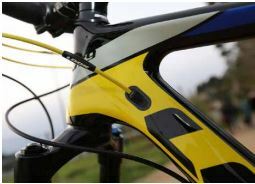 The Shimano «Side Wing» standard allows cables to arrive by the side and facilitates the gear shift. 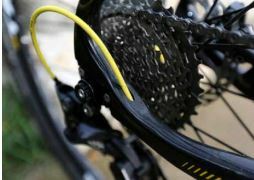 A good thing that Shimano has adopted it. In order to protect the transmission cables, the sheaths routing is integrated in the tubes and in the back basis. 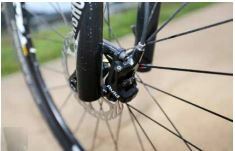 Only the fuel hoses of the hydraulic brakes remain in external routing under the diagonal tube to foster the simplicity and rapidity of mounting and maintenance of the disk brakes. 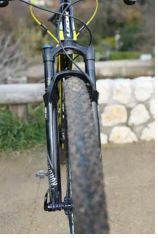 Probably one of the more mounted forks by manufacturers. 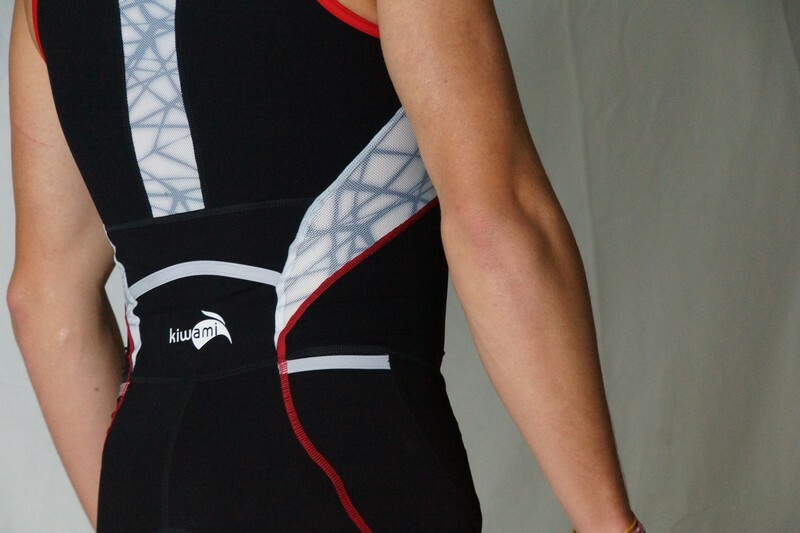 It offers a level of performance very acceptable for a good weight (1664gr in 29 inches). However, you won’t find orders to block it. It has an aluminum 1-1/8» pivot, also an aluminum tee and plunger and magnesium sheaths. With a weight of 2000gr, it is not the lightest model neither the most performing of the market but you will like the wheels for your rides. 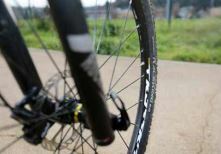 In any case, you will benefit from the quality of the Mavic wheels which is not to prove anymore. 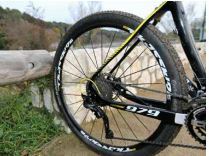 We find here the Continental Race King Sport model, tires with a «basic» rubber and a profile offering a low resistance to the bearing. Here again, we find one of the best-seller of the first mountings for manufacturers. Sram Avid DB3 brakes coupled with 160mm Avid disks will allow you to face up every situations which can offer the bike without any problem. 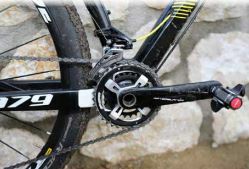 No fear to have on these elements because we find again the excellent Shimano Deore XT group for the 11-speed cassette (11×40), the shifters, the Shadow Plus front and back derailleur. A HG600 chain will activate everything. Very appreciable. 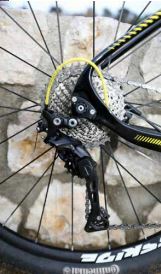 The crank is a FSA AfterBurner, aluminum model, double 36/24 chain-wheel. 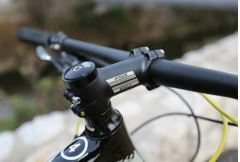 In aluminum, the V-DRIVE stem and handlebar are adequate. They are not very light but they also contribute to the homogeneity of the whole. Originally delivered with a WTB Silverado saddle, we took advantage of the test to try the Fizik Tundra Versus. 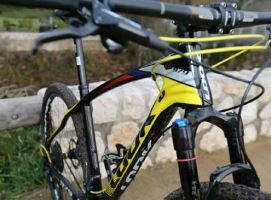 Not delivered on the bike, we have mounted a Look S-Trac pair for this test, we will talk about it in our next magazine. 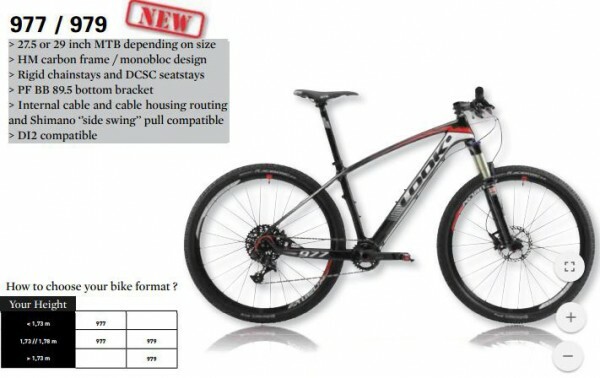 We have here a mid-range bike, positioned as such regarding the equipment and the price. 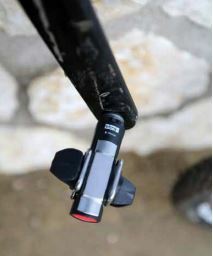 We have a bike globally light and handy, the Rockshox fork perfectly absorbs shocks and its thumbwheel remains easily accessible to be able to block it and avoid to pump too much in hills. As planned, we will never find fault with the group, offering a frank and fast shifting of the 22 gears depending on the climbs or obstacles. 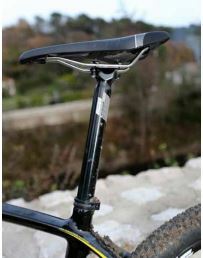 Whereas the actual tendency, with the aim of always winning flexibility on the back and thus comfort on semi-rigid bikes, is to offer a 27,2mm seat-post, Look has kept on this model a 31,6mm seat-post. 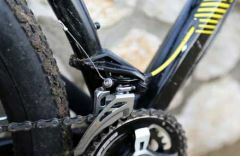 The notion of comfort in mountain biking remains sometimes a little bit unclear regarding how much we can be shaken up, in any case, you will still have the possibility to use a diameter reduction if you really want to try a narrower seat-post. But is it really useful regarding the work done on the frame itself? 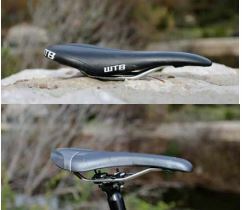 We only did one ride with the original WTB saddle and it didn’t cause any problem in particular. 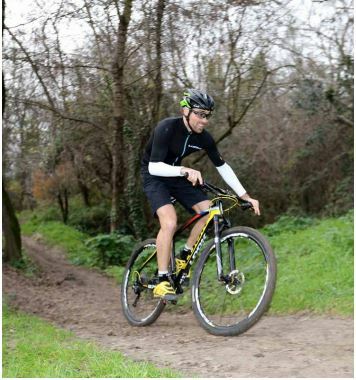 The tires have limited us, you have to choose your courses, their profile and the rubber is not clearly optimal for winter conditions, even in the South of France. 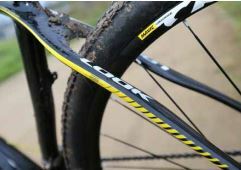 It is, as very often, the first thing you will have to change after buying the bike, and take advantage of that to try the tubeless via a kit. The Look 979 was a good surprise and will satisfy you! Comfortable everywhere, it will probably not limit you for XTerra ! A second version of the 979 exists, in red/white and on the basis of a mono-chain-wheel Sram GX1 mounting. Its catalogue price is 2799€.Le Look 979 aura été une bonne surprise et satisfera son utilisateur ! 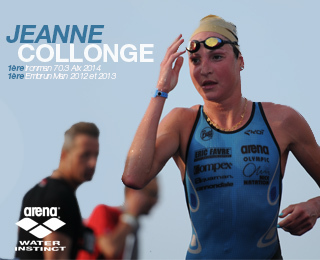 A l’aise partout ou il passe, pour une pratique Xterra ce n’est très probablement pas lui qui vous limitera dans vos résultats ! Une deuxième version du 979 existe, en coloris red / white et sur la base d’un montage en Sram GX1 mono plateau. Son prix catalogue est de 2799€.